Aloha friends! I am so excited to see that I have over 700 followers today!! You all are awesome for following along. I appreciate each and every person for stopping by and leaving me a comment here and there. I do my best to reply and get back to all of you, and hope you will forgive me when I reply a few days later! I am excited to have a little giveaway to celebrate! How many of you have this baby in your classroom? 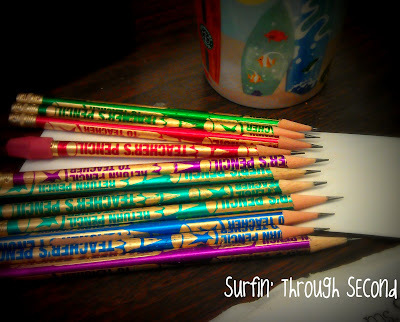 This is from Classroom Friendly Supplies and I love the way it sharpens! I have had lots of electric sharpeners, but they don't ever last an entire year! Well I decided to try this "Old School" manual one this year after hearing so many great things. I can put it wherever I like without worry of not having an electrical outlet. 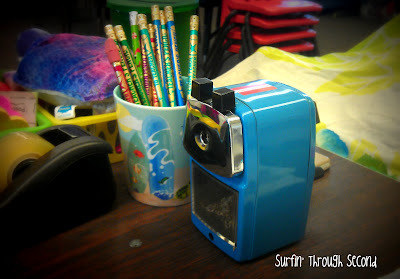 I have had this sharpener in my class all year and am ready to order another one to keep up with my kiddos. I have to admit I have been a bit selfish with mine. It sits on my desk, and only my pencil helper is allowed to use it. I love the way it sharpens. What teacher doesn't love sharp, lovely pencils? It does take some getting used to, but once you teach your students how to use it, they love sharpening their pencils with it! I plan to put my new one in my writing center. Well, I contacted Troy over at Classroom Friendly Supplies and he is going to send one of these babies to one of my fantastic followers!! All you have to do it enter my Rafflecopter. I will choose a winner next week! Oh, and did I mention that I will also be giving away 3 items from my TpT store? Just a little thank you for being such great supporters!! Thank you Emily! Congrats on 400!! I follow your blog! Congrats on 700!! Congrats and yes I follow your blog! Wow !!! That is a big milestone.....love to follow you Corinna :). Your problem pack and posters were such a big help this week !!! Cheers to lots more great posts from your beautiful island ! I follow your blog. Congrats on your 700 followers! I would LOVE to win this pencil sharpener! Love that sharpener. I have 2 in my room already. Best investment I ever made. Congratulations on 700! That is awesome. Congrats!!! Keep up the good ideas! I follow your blog. I am already a follower! Love your blog! I am a follower already :) Wooooohoooo on your milestone!!!! I follow your blog. I find it warms me up on the frigid days in northeast Ohio. I would love to win the pencil sharpener! WOW! Congratulations on 700 followers! I follow your wonderful blog! Congrats! I follow your blog and TPT store. Congratulations on 700! It's been so much fun following your journey! I always love reading your posts! :) Congrats! I do follow your blog and TPT store. Love your logo! I would LOVE to have that pencil sharpener. Nothing I've used seems to work for long. Congratulations on 700 followers. I already follow you and Troy! Congrats! I'd love the pencil sharpener! I've tried all year to win one! I follow your blog by email. I would love to the pencil sharpner. Congrats on 700. Congratulations on hitting 700! Yay! I need a sharpener like that. So far I have replaced three pencils sharpeners THIS YEAR! I <3 following your blog! Congrats on your milestone! Congrats! I would love to try out this pencil sharpener! A big congrats to you, bloggy friend!!!! I am a new follower...and I am looking forward to getting to know you better. I am a follower. This is the best pencil sharpener in the world! We follow you! Congrats on your milestone! We've had our eye on that sharpener... Thanks for the chance to win! Congratulations! I'm a new follower and I can't wait to hear all about your adventures. Congratulations on 700 and growing! I am a blog follower as well. I follow your blog and your TPT store :) Congrats on 700! I follow you! Thanks for great ideas and giveaway :) congrats on 700! Congrats on 700 followers! I follow your blog and I'm keeping my fingers crossed! I follow your blog by e-mail! I am a new "google friend" follower! Would love a sharpener to replace my broken one! What a great give away! I love your TpT products! Congratulations!! :) If you get the chance, would you contact me at service@LittleLearningLovies.com? I can't find a place to send you a private message and I have a question for you. I follow your blog! I am in need of a new sharpener, so this would be great! This is awesome! I have never seen this before. I am a follower on your blog and TPT and Facebook. I follow you on Facebook,TPT and your blog! I follow you everywhere lol (FB, TpT, blog). Thanks for the opportunity:)! Love your blog! Congrats on 700!